The compromised Independent Broadcasting Authority -IBA- has with immediate effect lifted the suspension of Prime Television. 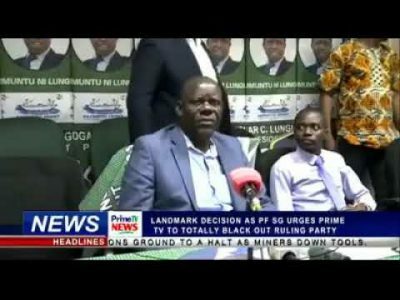 The PF influenced suspension was enforced on March 4, 2019 after a series of events among them the chasing of a Prime TV news crew from a PF press briefing by PF Secretary General Davies Mwila who accused the station of biased reporting and coverage of the Sesheke by election which the PF lost to the opposition UPND. Only 6 days was remaining of the 30 day suspension. She however said Prime Television has been tasked to among other things engage experts as news analysts and that analysis should be based on objectivity, facts and also the use of appropriate language. This implies that according to IBA (and the PF) the journalists who have been doing the news analysis on Prime TV are not experts. The IBA suspended Prime Television on 4th March 2019 for 30 days accusing the station of biased and unbalanced news coverage shortly after the station exposed what transpired in the Sesheke by election where PF thugs were beaten by police officers who have since been fired from the police.